Vertual Ltd is a partner of The College of Radiographers Industry Partnership Scheme (CoRIPS). This scheme provides industry with the opportunity to collaborate with the Society and College (SCoR) and provide financial support for research and educational projects. Virtual 3D immersive environment a novel tool in radiotherapy training, A Bojen and C Grau,Radiotherapy Technologists (RTT) News, ESTRO, #66, Winter 2007, pages 15-17. Available here. Virtual Training Wins Gong, Computer Weekly, 18 December 2007, pages 28-31, reports on the VERT team winning the coveted BT Flagship Award for Innovation Award at the BCS IT Industry 2007 Awards. Available here. VERT – a revolution in Radiotherapy Training, RadPro September 2007 e-News bulletin – article with numerous videos. Available here. 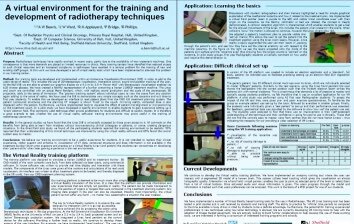 Radmagazine, 2 articles, VERT to revolutionise radiotherapy training, page 1, and How 3D simulation was developed in Hull for virtual tuition, Vol 33, No 385, June 2007. Virtual training system to revolutionise radiotherapy training, Health and Equipment Supplies website, 26 June 2007. Virtual lift for cancer tuition, Hull Daily Mail, 21 June 2007. Virtual guide to treat cancer, Hull Daily Mail, 17 May 2007. Virtual teaching offers new style of radiotherapy teaching, British Medical Journal, 333, pp 715, 7 April 2007. Available here. VERT: A Virtual Environment for Radiotherapy Training – training tools for the 21st century, AW Beavis, R Phillips and JW Ward, Takahashi (5th) Conformal Therapy Conference, Sendai, Japan, September 2007. Enhancing Radiographer Training using Virtual Reality Training Systems, AW Beavis, JW Ward, P Bridge, R Appleyard, AJ Jessop and R Phillips, Clinical Oncology, Vol. 19, Iss. 3, pp. s8, 2007. Available here. Training of radiation therapists using a 3D virtual environment, Boejen A, Beavis A, Nielsen K, Phillips R, Soerensen TS, Ward, J, Grau C, Radio. Oncol., 84:S275, Supp. 1, 2007. A New Simulation Technique Using Virtual Reality Visualization to Optimize Beam Geometry in Prostate Cancer IMRT, ASTRO, TR Williams, C Shang, A Beavis, J Ward, C Sims, C Prest, L Page and R Phillips. Poster and abstract. ASTRO 48th Annual Meeting, Nov. 5-9 2006, Philadelphia, Pennsylvania. International Journal of Radiation Oncology Biology Physics, 66(3), Supplement 1, pp S355 2006. A virtual environment for the training and development of radiotherapy techniques, A Beavis, J Ward, P Bridge, R Appleyard, R Phillips, poster, ASTRO 48th Annual Meeting, Nov. 5-9 2006, Philadelphia, Pennsylvania, International Journal of Radiation Oncology Biology Physics, 66(3), Supplement 1, pp S714, 2006. Virtual Reality based tools in Oncology training, AW Beavis, JW Ward, P Bridge, RM Appleyard, R Phillips, invited talk at ESTRO 25, Oct. 6-10 2006, Leipzig, Radiotherapy and Oncology, 81, Supplement 1, pp S69, 2006. A New Virtual Reality Simulation in Optimizing Non-coplanar Beam Orientations for Prostate Cancer IMRT, C Shang, T Williams, AW Beavis, JW Ward, R Phillips, L Page, abstract and presentation at International Congress on Medical Physics in Hangzhou, China, satellite meeting of World Congress, September 2006. An Immersive Virtual Environment for Training of Radiotherapy Students and Developing Clinical Experience, A Beavis, J Ward, P Bridge, R Appleyard, R Phillips, oral presentation, AAPM 48th Annual Meeting, July 30 – Aug 3 2006, Orlando, Florida. Medical Physics 33, pp 2164, 2006. Can Current Prostate IMRT be Further Improved with Immersive Virtual Reality Simulation?, C Shang, T Williams, A Beavis, J Ward, C Sims, R Phillips, poster and abstract, AAPM 48th Annual Meeting, July 30 – Aug 3 2006, Orlando, Florida. Medical Physics 33, pp 2075-6, 2006. Immersive visualization of patient-specific Intensity Modulated Radiotherapy (IMRT) treatment plans for education and training, Phillips R, Flores B, Ward JW, Kokkona V, Beavis AW, presentation and abstract Course Syllabus of Medicine Meets Virtual Reality 2004, pp 115-6, January 14-17 2004, Newport Beach. 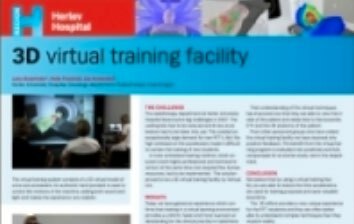 Virtual Reality Training for Radiotherapy becomes a Reality, R Phillips, JW Ward, L Page, C Grau, A Bojen, J Hall, K Nielsen, N Nordentoft, AW Beavis, Proceedings of Medicine Meets Virtual Reality 16, Studies in Health Technology and Informatics, 132, pp 366-371, January / February 2008, IOS Press. Available here. Is Virtual Reality training really a Reality? AW Beavis, R Phillips and JW Ward, Synergy Imaging and Therapy Practice, pp 22-24, September 2007. Radiotherapy training tools for yesterday’s future, AW Beavis, R Phillips and JW Ward, Imaging and Oncology, pp 30-35, 7 pages, 2007. Available here. VERT: A Virtual Environment for Radiotherapy Training, AW Beavis, R Phillips and JW Ward, Proceedings International Conference on the use of Computers in Radiation Therapy – ICCR, Toronto, 4-7 June 2007, Journal of Physics: Conference Series, 4 pages, IOP, 2007. Immersive Visualization with Automated Collision Detection for Radiotherapy Treatment Planning, JW Ward, R Phillips, T Williams, C Shang, C Prest, L Page, AW Beavis, Proceedings of Medicine Meets Virtual Reality 15, Studies in Health Technology and Informatics, 125, pp 491-497, February 2007, IOS Press. Available here. Development and Evaluation of a Virtual Radiotherapy Treatment Machine using an Immersive Visualization Environment, Bridge P, Appleyard RM, Ward JW, Phillips R, Beavis AW, Computers and Education, 49 (2), pp 481-494, 2007. Available Here. A Hybrid Virtual Environment for Training of Radiotherapy Treatment of Cancer, Phillips R, Ward JW, Bridge P, Appleyard RM, Beavis AW, Proceedings of SPIE and IS&T Electronic Imaging: Stereoscopic Displays and Applications, San Jose, USA, Jan 2006, SPIE Vol 6505, pp 6055008 1-12. Immersive Visualization Training of Radiotherapy Treatment, Phillips R, Ward JW, Beavis AW, Proceedings of Medicine Meets Virtual Reality 13, Studies in Health Technology and Informatics, 111, pp 390-396, January 2005, IOS Press. Available here.